Home > Ugly Christmas Sweaters > mens MED Ugly Christmas Sweaters > (mens M) Ugly Xmas Sweater Vest. Santa & Rudolph carrying Towers O'Gifts! 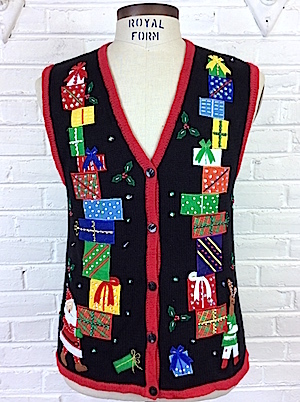 Super fun ugly Christmas sweater vest. Black knit with Santa and Rudolph carrying 2 towers of beaded and dazzled presents! Sprigs of green holly with red bead berries surround. On the upper back are 2 gifts. Black button closure, red trim. Tag reads Bobbie Brooke. Ramie/cotton.